Viewing topic "Get high-quality video for music play Motif XF." There is a Roland FA-07 and a Motif XF7 synthesizer. 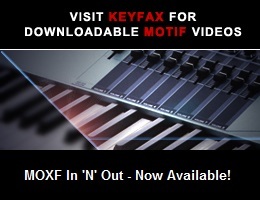 My question is: Can I make this perfect sound quality when I play on the Motif XF synthesizer and record video? There is no FW16e and no external sound card, but the Roland FA-07 has a USB Audio Interface. If I connect the two synthesizer with a MIDI cable, is it possible for my Roland FA-07 to be my sound card? The goal would be to create a perfect audio quality video for YouTube. MIDI don’t transfer audio, but maybe the Roland has audio ins? This would make sense since it can be used as an interface.